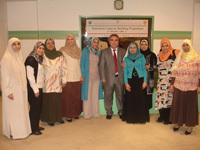 The Centre organised training on “National Accounts: Supply and Use Tables” at the Central Agency for Public Mobilization and Statistics (CAPMAS) of the Arab Republic of Egypt, on 6-8 June 2011. The Course was provided by Mr. Mehmet Kula, an expert from the Turkish Statistical Institute (TurkStat), and was attended by 22 staff members of the CAPMAS. Discuss and plan together with CAPMAS future activities and missions concerning this issue, if they need technical assistance.